The Durkan dscvr19 student design competition, in partnership with NEWH, exists to identify and exhibit the talent of the next generation of designers in the hospitality field. This year’s grand prize winner was Utah State University student Brianne Brooks, whose “Cosmos” wowed judges with designs inspired by the colors and depth of space nebulae. Brooks won a $2,500 NEWH scholarship from Durkan and an all expenses paid trip to Las Vegas to be honored on-site at HD Expo. The Durkan dscvr19 design competition has been established to exhibit the talent of designers in the hospitality design field and contribute toward the education of future designers, in partnership with NEWH. Students are encouraged to participate and be discovered! Durkan has partnered with NEWH to bring a unique member only opportunity. In lieu of entry fees, you simply must be a student member of NEWH. Durkan is the leading US manufacturer of custom designed carpet to the hospitality industry. Specializing in durable Public Space, Corridor and guest room carpet, Durkan offers solutions to any custom design need. As design leaders, we offer the largest selection of archived patterns in the USA or we can make your custom design vision a reality. NEWH, The Network of the Hospitality Industry, is the premier networking resource for the hospitality industry, providing scholarships, education, leadership development, recognition of excellence, and business development opportunities. Members of NEWH, Inc. are professionals actively engaged in development, management/ operations, architecture, communications, design, distribution, education, manufacturing, production, purchasing, and sales of the Hospitality, Foodservice, Senior Living and related industries. For more information go to www.newh.org. Ballroom & Pre-function areas are to be designed as separate components, each area divided by transition stripes in the doorways (Transition Strips to be 4″ solid carpet). Ballroom & Pre-function designs are to be different but designed to coordinate. Number of colors not to exceed 12 in total. Please think of each area as your blank canvas, designs confined only by the walls, the most innovative approach would be to avoid using surface patterns with an obvious repeat, with the exception of textural elements used to add detail and layering. We’d like to see how the entire floor space could become one large design. Submit final patterns with photos or visuals, concept boards, sketches, write up, or other inspiration for PDI (Precision Dye Injected) carpets. Completed package to be sent to Durkan for judging. Deadline Friday, March 15th, 2019. 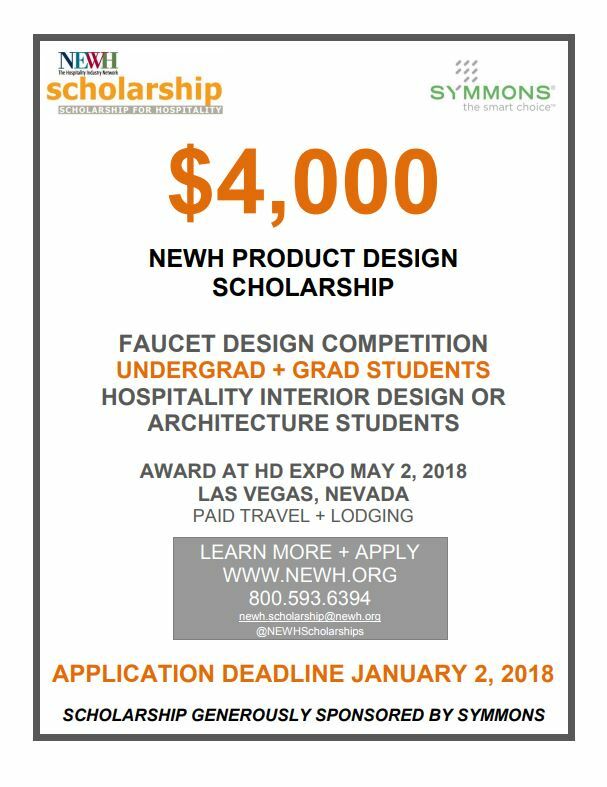 $2,500 NEWH scholarship from Durkan and a trip to Las Vegas for the HD Expo show to receive award. Winning student designs will be on display at the Durkan booth. Durkan will promote and catalog winning designs. $1000 and a trip to Las Vegas for the HD Expo show to receive award. See “Contest Rules” for specifications and requirements of your design submittal. Visit https://www.mohawkgroup.com/durkan/dscvr for more information. Founded in 1984, NEWH is an international non-profit organization, which provides access to the hospitality industry through scholarships, mentorship, and education. NEWH chapters and regional groups award scholarships annually to students pursuing a future within the hospitality market. 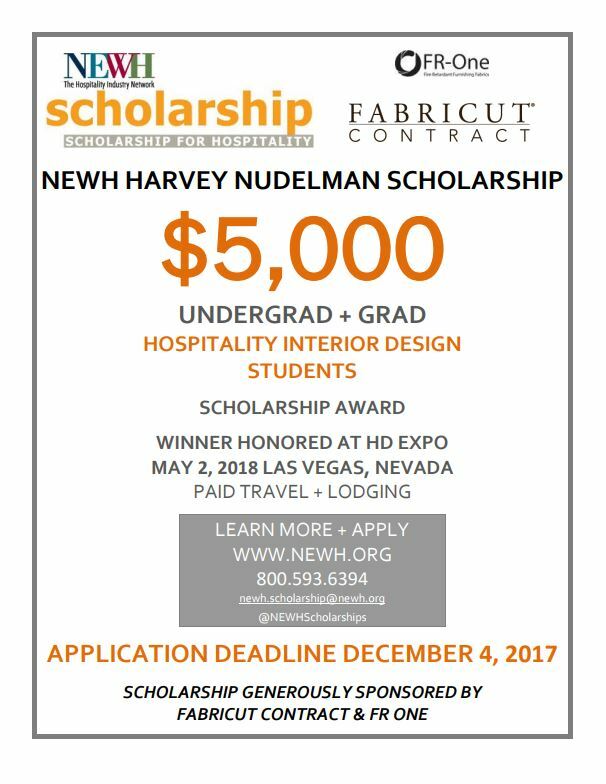 NEWH scholarship alumni boast careers in hospitality design, development, hotel management, operations, and culinary, around the world. The Harold W. Grieve Scholarship Committee has significantly INCREASED the scholarship winnings! Don’t miss your chance to take a big bite out of tuition and send in your entry today! Entries should be class projects-commercial or residential-that show your ability to create innovative concepts, space plan, furnish and decorate. Submissions should be two-dimensional presentations only. Presentations will be made on Friday, August 24, 2018 at the Designers Lounge at the LA Mart. This competition is being held as part of the Rocky LaFleur Lifetime Achievement Award Celebration on September 26. Winning scholarships will be awarded at the Celebration. Presentations will be approximately 20 minutes per student and will be held on Friday, August 24, 2018 between 10am and 3pm at the LA Mart, 1933 S Broadway, Downtown Los Angeles. NEWH Los Angeles Founding Chapter scholarships are now open! 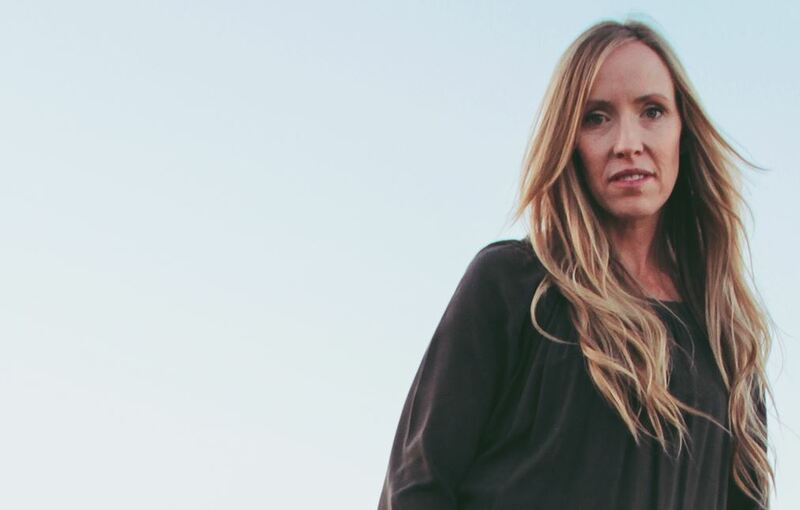 Continue the legacy of Ingrid Skulstad Williams by achieving your educational goals. 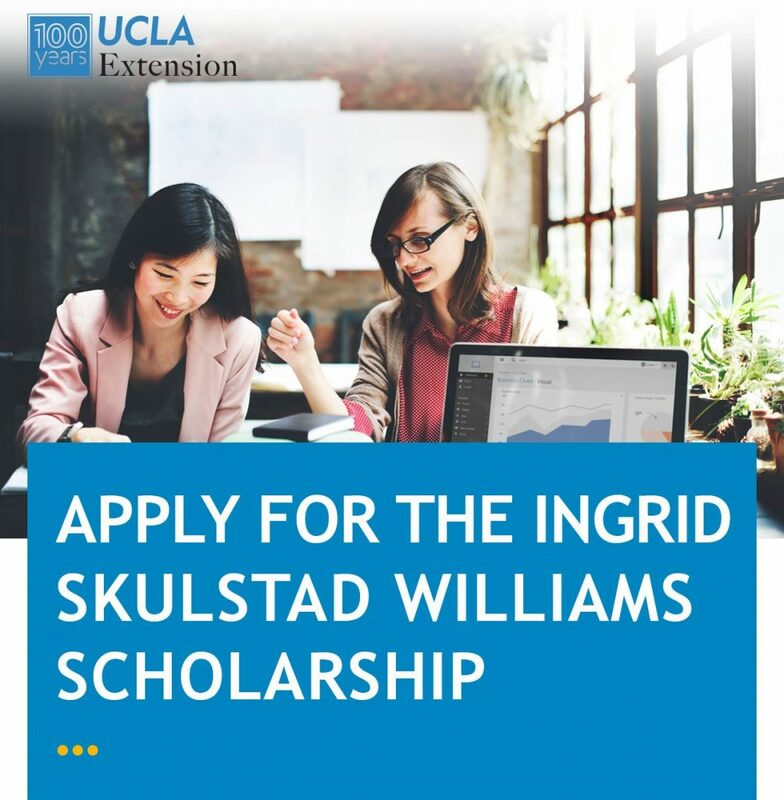 The Ingrid Skulstad Williams Scholarship is a needs-based scholarship dedicated to helping women get the education necessary to have a successful career. Each year, winners of the scholarship are awarded up to $5,000 to help them reach their goal of pursuing and completing a certificate program at UCLA Extension. Ms. Skulstad Williams attended UCLA Extension in the late 1970s to pursue business courses, which helped her launch a successful career in the travel industry. Through her estate, Ms. Skulstad Williams established this scholarship endowment to help women who would otherwise not have the financial means or opportunity to attend postsecondary education. Ms. Skulstad Williams strongly believed that lifelong learning can change lives. Applications for this scholarship will be accepted from Monday, April 23, 2018, until Monday, May 21, 2018. The submission packet requires letters of recommendation, transcripts, and more, so get a head start on the process. The deadline to apply is Monday, May 21, 2018, at 4pm. Below is some information of a scholarship opportunity for you all. “Our scholarship is called ‘ChooseBestMattress’s $1500 Scholarship’, and it’s designed to help students in multiple areas. Our website is all about Sleeping Tips, Mattress reviews, Tutorials. 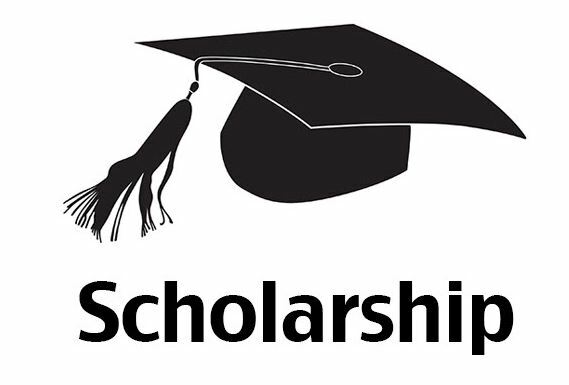 We would love to offer an yearly scholarship of $1500 to the right candidate. Deadline of submission: Before 30th October 2017 (Also Every Year). Who Can Participate: Students from High school, Undergraduate, Master Degree, PhD and adult learners are all also eligible to apply for this essay scholarship. (Must be from USA or Canada). How to Apply: Write an essay about 1) “Tips to get A Good Night Sleep” or 2) “Correlation Between Mattress and Sleep”. It should be maximum 1,000 words long. Use facts, medical advice, products – whatever you need to create a useful text. How to Submit: Send the PDF document to Richard: richardmorse441@gmail.com with email title: “$1500 Scholarship Application”. 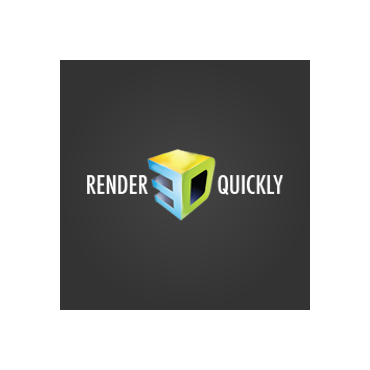 Render 3D Quickly is excited to announce the launch of the Render 3D Quickly Scholarship Program. One college hopeful will be chosen to receive a $1,000 scholarship to be used towards their higher education. You don’t have to be an expert on the subject; the most important thing is originality. Creativity and an understanding of technology in industries such as construction, will help set your entry apart.